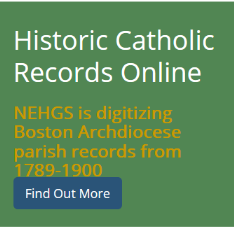 The New England Historic Genealogical Society's website, AmericanAncestors.org, has updated its searchable database of parish records from the Roman Catholic Archdiocese of Boston. In this update, ten new volumes covering 1854 to 1900 from the Immaculate Conception in Marlborough, Massachusetts have been added. This church largely served Marlborough's community of immigrant Irish Roman Catholics, although there may be some French Canadian Catholics included in the earlier records. The ten new volumes are linked below. I was able to view images with my free Guest Account.